In much the same fashion as most of Chrysler&apos;s lineup, the Jeep Compass received some desperately needed improvements for 2011. And just as it is with the rest of the lineup, these improvements are all the sort of things that should have been done in the first place. Of course, an argument could be made that it is unnecessary for the Compass to exist at all. Even with the significant improvements that have been made, it still seems odd to call the Compass a Jeep. This problem isn&apos;t quite as bad as it was with the previous Compass, as this generation finally has a Trail Rated package, known as the Freedom Drive II package. It remains to be seen whether many buyers will opt for this package, but our prediction is that the people who want a four-cylinder crossover with a CVT are not the same people who want a Trail Rated vehicle. 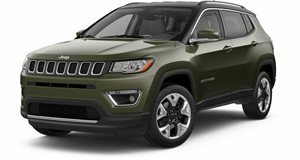 But the fact that it probably won&apos;t be popular hasn&apos;t kept Jeep from putting serious effort into giving the Compass some real off-roading credibility. All-wheel-drive, upgraded suspension with a one-inch lift, skid plates, tow hooks, fog lights and all-weather floor mats join a host of other upgrades which give the Compass the ability to tackle actual trails. It should be noted, however, that this does not mean the Compass can do what other Jeeps can do. It is still a crossover, and it is still pretty obviously intended to stay primarily on the road. Not that it handles the road particularly well. You have an option of either a 2.0-liter 158hp four-cylinder or a 172hp 2.4-liter, and neither of them provides enough power. This lack of power makes the Compass unpleasant and frustrating to drive, especially at highway speeds. The ride and handling are somewhat better sorted, but the Compass is still in the OK-for-a-compact-CUV area at best. Improvements have been made to the interior, although these improvements are less dramatic than they&apos;ve been in other Chrysler vehicles this year. Higher-quality materials have made the cabin a nicer place to be, but not quite nice enough to distract you from the other flaws with the vehicle. The looks of the new Compass are, thankfully, much better. Gone is the horribly cutesy look of the old Compass, which had always seemed to be mocking the rest of the Jeep lineup. Cuteness like that might work on a New Beetle, but it does not work on a Jeep. The redesign has focused primarily on the area in front of the A-pillars, but to be fair, that was what needed the attention. The unchanged parts of the exterior manage to blend with the redesigned front end seamlessly, and there overall look is now much more Grand Cherokee-esque. Since the Compass has always been more of a Jeep-themed fashion accessory than an actual utility vehicle, this new look will probably serve it well. The added utility, on the other hand, is a well-meaning but ultimately half-assed and pointless answer to a question that nobody was asking.